Getting up early and getting the kids off to school has gone great so far, except for one thing. The kids jump out of bed early, that’s no problem – but they’re accustomed to eating a little later in the morning, after they’ve been up for awhile. Their little stomachs don’t seem ready for food at 6:30 A.M. For a couple of days I was throwing away a lot of half eaten eggs and stuff. I certainly don’t want them to eat at school (nutritionally inferior offerings) but I don’t want them to go off with an empty belly either. They need high quality protein in order for their little brains to work properly to study. I decided to look at some quick breakfast options that the kids can hold in their hands and eat while they walk to the bus stop or in the cafeteria once they get to school, after they’ve been up for awhile and have worked up an appetite. Stuff like granola bars aren’t my thing, neither is cereal. Extruded grains are a no-no in this house. And carbs aren’t really a great idea in the morning anyway, especially if the kids aren’t going to be eating lunch for a few hours. Here are some of the ideas I came up with for quick before school breakfasts. Spread a little butter on the English Muffins then top with cheese. (I use raw organic cheese and grass fed butter – either KerryGold or Organic Valley’s pastured butter.) Bake in the oven until the cheese melts. (Or yu can toast them first and then place the cheese on top and warm until it melts. Or use shredded cheese.) Meanwhile, scramble an egg. Put the scrambled egg on top of the cheesy English Muffin. You can fry some bacon (make sure it’s organic and grass fed!) or sausage to go on it too. This is what we had this morning. The kids were munching on them as they walked out the door. Easy to hold and eat. Ever since I tried these the first time, I’ve been hooked. I got the recipe from Cheeseslave who got it from a cookbook called Cooking with Coconut Flour. Since youngest and I don’t eat wheat, we get our muffin fix with these. They are SO VERY delicious and surprisingly filling. I cannot eat two of them! 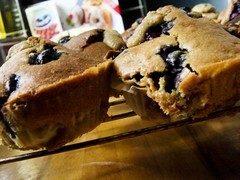 Muffins are portable and delicious even when cold so these are perfect. Smoothies worked well the other morning because the kids could sip on them slowly while they got ready. I made mine with raw milk, strawberries, banana and organic vanilla yogurt. Got 50 smoothie recipes right here. In a pinch, I give them each a Larabar. These are just about the only “granola” bars I approve of. They’re made from dried fruit and nuts – that’s it. The kids love them and I always have a supply in the pantry. No HFCS or other cheap sweeteners, no trans fats, no soy (yuck! ), no fillers and no grains. That’s what’s working for us right now. I’m dreading breakfast that early this coming year. Nicky is very much like me, and I’m no way in the mood for a full load of breakfast that early. I’ll have to reference this post. I just found a nut bar that is super tasty- Trio bar by Mrs. May’s. 3 nuts, 3 seeds and 3 fruits in each. Vegan, gluten free, yummy.